You already understand how your organization would benefit from the huge long-term benefits and savings that come from upgrading your facility’s lighting to high-performance LEDs. But those long-term benefits can seem far away to your CFO when he or she sees the upfront cost of such an upgrade. Large expenses can be a tough sell for organizations. Even when the expenditure would deliver savings far beyond its cost, the eye-popping price tag can delay what would be a wise upgrade. The only thing better than getting a great product is getting someone else to pay for it! There are numerous opportunities available at the federal, state and local level for incentives, rebates and tax credits to help offset the cost of switching to LED lights. These rebates and tax credits can shrink the payback period considerably, so you can quickly realize a return on investment. These incentives can be discovered free of charge. For example, when Portland, Oregon wanted to upgrade the street lighting in its historic neighborhoods with Amerlux’s Avista pedestrian light, they took advantage of rebates from the Energy Trust of Oregon and the Oregon Department of Energy. These rebates reduced the project’s payback period, complementing the 60 percent energy savings Amerlux’s Avista LED delivered. 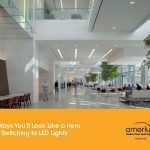 To maximize savings for you, Amerlux designed most of its LED products as either Energy Star-rated or DLC-listed, making them eligible for a variety of rebates and tax incentives based on your location. Most utility companies offer rebates or some other kind of incentive to upgrade to efficient technology like LEDs. These rebates can influence your purchasing decisions, so definitely have a chat with your utility early in the planning process. This website is the most comprehensive information source on incentives and policies that support renewables and energy efficiency in the United States. The database is operated by the N.C. Clean Energy Technology Center at N.C. State University. Managed by the Environmental Protection Agency and the Department of Energy, Energy Star’s Rebate Finder allows you to search for incentives by zip code and by product type. The Energy Department maintains a list of tax credits, rebates and other savings available for a variety of green technologies, including an extensive list for LED lighting projects. If the upfront cost is still too large for your organization to make the investment, consider breaking the project into phases. Tackle one phase at a time and the savings you realize from one phase can help pay for the next. Consider three things as you prioritize: which lights are the most inefficient, which lights are used the most and which lights are the hardest to maintain. Replacing the most inefficient lighting can yield substantial energy savings. Are you still burning incandescent bulbs in your building? Get rid of those energy-eaters. What lights are most used? 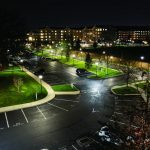 Safety dictates that parking garages, stairwells, common areas and exterior lighting often need lights to be on 24/7, or at least all night long. Upgrading these lights will also yield large energy savings. Regarding maintenance, are there certain lights which are expensive to keep lit? For example, maybe you need an expensive lift for high ceiling lights. These are also great candidates to replace for quick savings. For most buildings, lighting is the largest electrical draw, using nearly one-fifth (17 percent) of the electricity consumed in commercial buildings. Of course, one of the most well-known benefits of LEDs is how energy efficient they are. Upgrading to LED lighting can slash power costs by up to 80 percent with dimming controls. When Los Angeles upgraded its historic pedestrian lights with Avista, a cutting-edge retrofit solution by Amerlux, it slashed energy usage by 75 percent. The Queens Museum in New York City cut energy costs by 90 percent by replacing their old halogen gallery lights with SPEQ, a clean-styled LED track light system from Amerlux. On top of the easily quantifiable energy savings, there are also significant maintenance and labor savings. 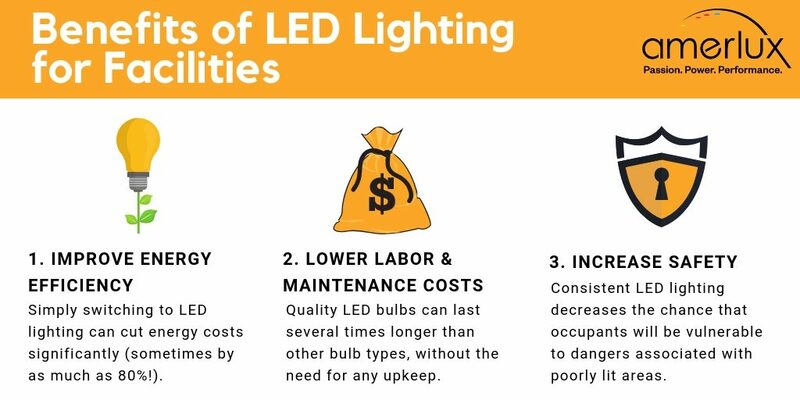 Since LEDs don’t need replacing for years and years, you can also say goodbye to regular maintenance expenses, like paying overtime so workers can relamp bulbs. Try to quantify how much time your crews spend on lighting maintenance—it’s probably a lot. Upgrading to LED lighting would eliminate the ongoing game of “Whack-A-Mole” your workers are stuck playing with burnt out lights. That would free your crews so they could focus on bigger things—or your organization can trim headcount. Either way, it’s money saved for your organization. When you combine the energy savings, maintenance savings, rebates and tax incentives from LED lighting, the payback period can be as short as just a few months. Request a free consultation today!